In a funeral service punctuated by both tears and fond laughter, Boston Firefighter Michael R. Kennedy — killed in a ferocious fire last week in the city’s Back Bay neighborhood — was called a “good soul” and a “free-wheeling spirit’’ today as he was mourned at a West Roxbury church by his family, friends, and comrades. Davin Patrick Kennedy, speaking on behalf of Kennedy’s family during the Mass at the Holy Name church, invoked laughter as he recalled his cousin’s sense of humor, his fearlessness — and his love for long-time girlfriend, Sarah Wessmann. “He never saw a challenge he wouldn’t accept,’’ said Davin Kennedy, listing the many things his cousin tried and enjoyed, including skydiving, snowboarding, golf, and softball in the firefighter’s league. Davin Kennedy, who choked back tears at times, was among several who spoke to a church packed with relatives, friends, Boston firefighters, and dignitaries, including Boston Mayor Martin J. Walsh, who said the loss of someone so devoted to others has been a blow not just to his family and the department, but to the city as a whole. A US Marine Corps veteran of the Iraq War, Kennedy volunteered to help burn victims, was among the first to respond to the Boston Marathon bombings, was devoted to family, and was a Big Brother for the past seven years. Kennedy was killed in the line of duty with Fire Lieutenant Edward J. Walsh Jr. last week in the fire. Kennedy and Walsh, 43, were killed in a fast-moving, surprisingly ferocious at 298 Beacon St. Funeral services were held Wednesday for Walsh, a Watertown native who was laid to rest next to his father, a Watertown firefighter. Rich Paris, president of the Boston firefighters’ union, fought back tears as he spoke about Kennedy, Walsh, and the fire that claimed their lives. As the Mass neared its end, Kennedy was posthumously awarded the International Association of Firefighers Medal of Honor, which was presented to his father, Paul Kennedy. After accepting it, the father raised the box, holding it above his head, prompting the congregation to rise to their feet and applaud. The father then walked to his son’s casket and put the box holding the medal on it. Delivering the homily, the Rev. John Unni, whose church is near the Boylston Street firehouse where the men were based, described how Kennedy was recalled by his parents, his siblings, and the Milton teenager he mentored as a Big Brother. Drawing smiles, Unni said Kennedy’s mother, Kathy Crosby-Bell, recalled how when Kennedy was a restless teenager she would often warn him that he was either going to prison — or the White House. She also told of how her son would call her up, promising to stop by and cook dinner for her, only to fall asleep on the couch, leaving the cooking to her. Kennedy’s father, Paul, considered his son a “good soul,’’ whose life ended too soon, despite his prayers to protect him, Unni said. Turning directly to Alex Beauzile, who Kennedy mentored for seven years, Unni recalled that when he met the teenager, the teenager shook his hand and asked him, “Who’s got the stronger grip?” Unni suggested that Beauzile had absorbed some of Kennedy’s challenging spirit. “He always wanted to be there to help someone do the right thing. He was someone who lived for others, who was always determined to put a smile on the face of others around him,” he said. Unni also spoke to Kennedy’s peers, urging them to care for themselves emotionally as they return to work and mull the questions that likely will surface during quiet moments. The church was packed with neighbors, firefighters, family members, and even members of the American Infidels motorcycle club Kennedy belonged to. Cardinal Sean P. O’Malley was the last speaker, telling the audience that Kennedy’s death was a reminder that without the help of strangers, no true community can survive. A wake was held Wednesday at the P. E. Murray funeral home, a short distance from Holy Name. This morning, Kennedy’s remains were taken from the funeral home to the church on the back of Engine 33, the engine that raced with Ladder 15, Kennedy’s truck, from their Boylston Street firehouse to the the nine-alarm blaze last week. The casket for Kennedy, a US Marines combat veteran who saw service in Iraq, was draped with an American flag. His fellow firefighters walked next to Engine 33, their white-gloved hands always in contact with the vehicle. Kennedy’s friend, Firefighter Paul J. McIrney of Engine 53 in Roslindale, carried Kennedy’s helmet, walking ahead of the engine. 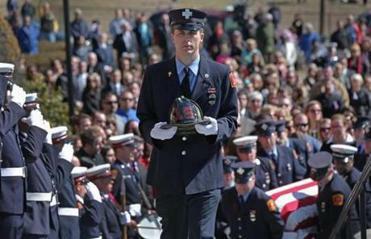 Kennedy is to be interred at the Fireman's Lot at the Forest Hills Cemetery in Jamaica Plain. The procession to the church moved slowly down Centre Street, led by a drum and bagpipe corps from multiple departments that were merged into one long platoon. Thousands of firefighters from across North America stood at attention, and many civilians put their hands over their hearts as the somber procession rolled slowly past. Earlier today, dozens of buses — schoolbuses, MBTA buses, chartered buses — lined West Roxbury Parkway , delivering firefighters to pay their respects. Along Centre Street, several businesses unfurled huge American flags over their windows and exterior walls. Nannies and mothers with children watched the host of firefighters in awe. “This is such an impressive sight,’’ said 40-year-old Melissa Murphy, who stood in front of Holy Name’s parish center with her 3-year-old son, Owen, who had come to the see the firetrucks but seemed more absorbed in collecting rocks from the sidewalk. “I told him there was a celebration for a firefighter who got hurt,’’ Murphy said. “I don’t think he understands. Boston Firefighter Moe Cuevas said today’s funeral was the last part of a healing ritual for the department, of saying goodbye to the firefighters. But it was also, more importantly, a way to help the families cope with their losses. Maria Cramer can be reached at mcramer@globe.com. Follow her on Twitter @globemcramer.Eric Moskowitz can be reached at emoskowitz@globe.com.Meghan E. Irons can be reached at meghan.irons@globe.com. Follow her on Twitter @meghanirons.